When searching online for things to do when the Holland America Westerdam stopped in Sitka on our family cruise, I came across a place called Fortress of the Bear. One of the Sitka locals had turned abandoned clarifier tanks (which are 3/4 acre each) into habitats for orphaned bears that otherwise would have died. Not only did this sound like an interesting place to see, but also a place to safely get plenty of close-up photos of bears. Sitka also has a raptor center. It’s closer to town than the bears and within walking distance for a lot of people, but too long of a walk for some folks. During my pre-trip online research I read many comments other people had made on various websites. Some said the Fortress of the Bear had a shuttle from the cruise ship dock that would also let people off at the Raptor Center, others said they no longer had a shuttle at all. We never could get a definite answer about that before the cruise or find anyone on the ship who knew anything about the shuttle either. The ship had excursions to both the Raptor Center and the Fortress of the Bear, but we wanted to go on our own. Some online comments mentioned taxis would be available, but since we did not see any we were quite happy to find the shuttle. As we disembarked the tender, we saw a number of people with signs for various activities. We headed straight to the one for Fortress of the Bear. Though we could have gotten off the boat around 8am, we waited until closer to 9:00, having been advised that like most things in Sitka, the Fortress of the Bear did not open until 9am. As it turned out, they did open at 8am when ships came in early, and we could have taken an earlier shuttle with almost nobody else on it. Our shuttle was not very crowded either. The big crowd started with the next one. The person with the sign said that whether or not their shuttles would stop at the Raptor Center depended on the driver, but our driver said they all stopped there. We encountered road construction along the way, which meant the shuttles did not always keep to their scheduled times as they sometimes had to sit awhile and wait before passing through the construction area. While we waited to go we saw eagles flying around nearby. Once at the Fortress our bus left when we got off. My parents and sister had come with me there, but the rest of the relatives we cruised to Alaska with did different things in that port. We had about an hour to spend at the fortress before the next bus would come by. The owner took everyone up to a viewing platform where he told us about the bears in the tanks on either side while we all watched them play. One tank held two brothers who enjoyed playing with a ball hanging over the water. They jumped up to swat the ball making great splashes in their pool. Many eagles perched in nearby trees waiting for a chance to steal food meant for the bears. When the opportunity arose the eagles took flight, sometimes rewarded for their effort with food snatched from the bear’s enclosure. The other tank held two brothers and a sister, each of whom knew a different trick, which they quite happily performed for food. These bears are never allowed to be released into the wild due to Alaska’s laws. Sometimes hungry bears visit the towns in search of food. If the mothers get shot, the cubs used to have a death sentence too. Now they can go to the Fortress of the Bear to grow up in as natural a setting as possible for them. Zoos or wildlife parks sometimes take the bears in. Bears raised there are accustomed to human contact and adapt fairly easily to their new life in a zoo. Bears who go straight from the wild to zoos arrive traumatized and sometimes never fully adjust. The tanks enclose as natural of a habitat as they could provide. The bears have water to swim in and caves within log piles. They had standing trees initially, but the bears pulled trees up and knocked them down until they had none left. The enclosure wall appears to have an opening that probably goes into some sort of shelter. They are given an ever-changing variety of different toys to play with and also seemed to enjoy swimming. The Fortress just had brown bears (grizzlies) when we visited, but sometimes they have black bear cubs as well. It also had some pens with an assortment of birds including ducks and turkeys. They had restrooms and a small gift shop near the entrance where the busses come and go. If you plan to go to Sitka, Fortress of the Bear is definitely worth a visit. It’s fun, interesting, and educational. You also are guaranteed to see some active bears who have a tendency to do really cute things. In addition to saving the lives of bears, the Fortress of the Bear also serves as a recycling and composting facility, utilizing outdated produce, dairy, and bakery products from local markets as food for the bears and then composting bear’s waste, saving the city and private businesses many dollars in waste disposal. 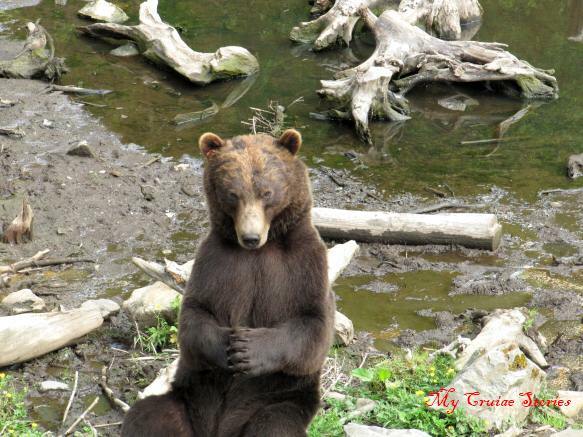 This entry was posted in Alaska, Holland America, Port Cities, Shore Excursions, Westerdam and tagged Alaska, bears, cruise, Fortress of the Bear, Holland America, photos, Sitka, travel, Westerdam. Bookmark the permalink. The world is definitely a better place for all the different facilities and organizations that take care of orphaned and unwanted animals. Fun story and fun photos of bears. Love the picture of the bear playing with the ball. Great photos! This post is exactly how I like to get up close and personal with bears. I’m happy that they’re in a place where they’re safe, free to roam and have plenty to eat, excluding kids and me. That is definitely the safe way to see them. I’ve only been up close to a bear in the wild once, and it lived in an area where it was accustomed to seeing people. I rode past it on a horse with a blind eye, who happened to have the blind side toward the bear. We must have been upwind because he didn’t smell it either. As he strolled nonchalantly by, I kicked myself for not having brought my camera. Let me get this straight, you’re riding on a half blind horse when you just happen upon Gentle Ben?!?!?! That’s quite a Lame Adventure! We were camping where we had to ride through some trails to get to the ocean and the bear lived in the woods there, though we were not told the woods had bears when we booked the spot. My kids who were following me on fully-sighted horses had their hands full passing the bear because their horses spooked at it, but that wasn’t the first time my horse’s blind eye was an advantage. He didn’t have much depth perception though, so whenever he jumped an obstacle for the first time he’d go about twice as high as he needed to, which is better than running into it I suppose. I am an advocate of jumping over instead of running into. I have also been known to bounce off of. Bouncing off is preferable to breaking things I suppose, particularly if the things getting broken happen to be bones. So are those old clarification tanks from an old sewage treatment plant? It’s a good way to use the old facility but I wouldn’t want to be the one who had to do the clean up for the new residents. They did not say where the tanks came from. These are really great pictures of the bears and I’m sorry I didn’t go see this place myself. I would recommend it over the Raptor Center. Very good pictures! 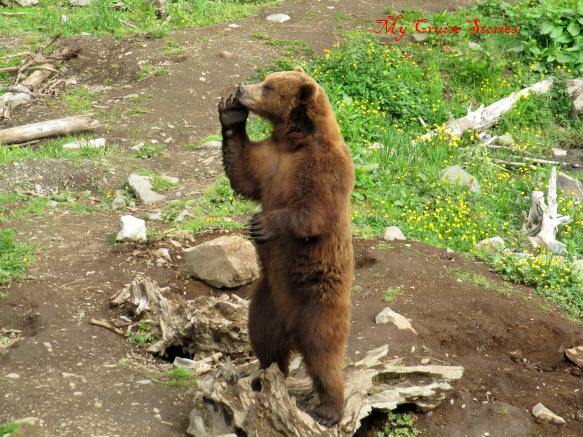 That one bear sure looks like he was praying! It was an interesting place to see. The bears looked like they had a pretty good life there.